-- At 3:20 pm, Mohammed Abdulnaby, 27, a resident of Al-Juron in the town of Jabaliain the North Gaza district, was shot in the head with a live bullet at the demonstration in eastern Jabalia. Mohammed died from his injuries at 4:30 pm the same day. 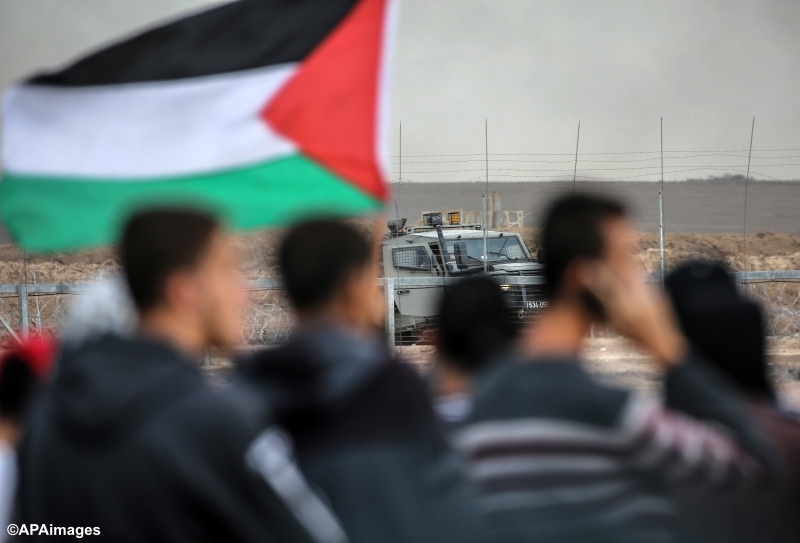 -- At 4:45 pm, Nasser Abu Tayyem, 19, a resident of the town of Khuza’ain the east of the Khan Younis district, was shot in the head with a live bullet at the demonstration in eastern Khan Younis. Nasser died from his injuries at 5 pm the same day. -- At 5 pm, Ahmed Abu Libda, 22, a resident of Bani Sohaila in Khan Younis, was shot in the chest with a live bullet at the demonstration in eastern Khan Younis. Ahmed died from his injuries at 5:15 pm the same day. -- At 5:15 pm, ‘Ayesh Sha’ath, 22, a resident of Al-Fukhari neighborhood in the east of Khan Younis city, was shot in the chest with a live bullet at the demonstration in eastern Khan Younis. ‘Ayesh died from his injuries at 5:30 pm the same day. 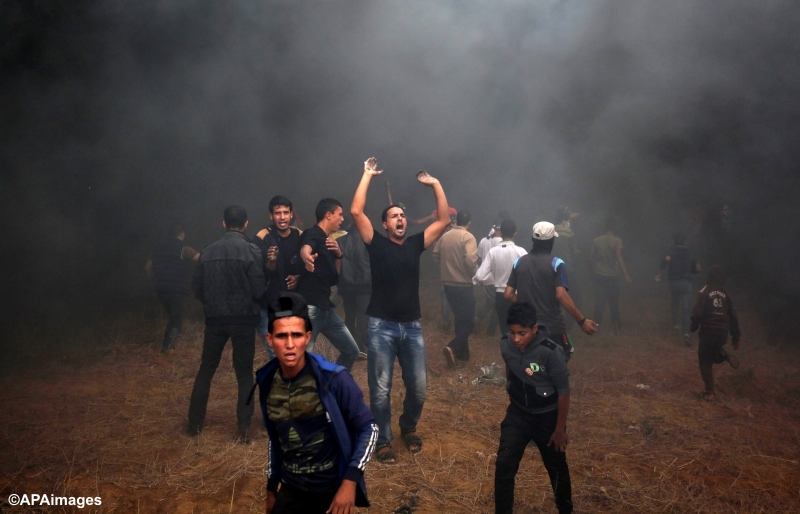 -- Yasser Abu Habeeb, a 26-year-old volunteer paramedic with the Pulse of Life team, was injured by shrapnel from live fire in the chest and neck at the demonstration in eastern Rafah, in the south of the Gaza Strip. -- Alaa’ Sabbah, a 39-year-old paramedic with the Palestinian Civil Defense, was injured by shrapnel from live fire in both legs at the demonstration in eastern Jabalia. 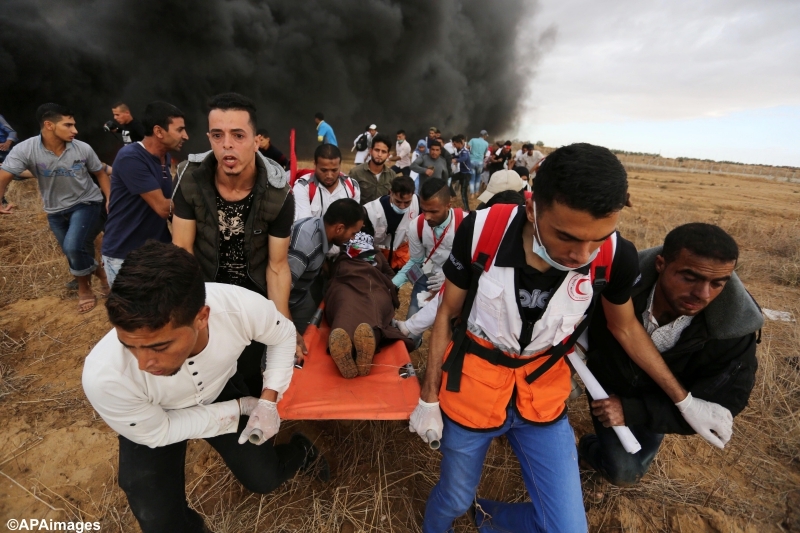 -- Rajab Al-Khaldi, a 28-year-old paramedic with the Ministry of Health, was shot with a live bullet in the right leg at the demonstration in the east of Al-Bureij refugee camp. -- Basma Wishah, 26, was injured by shrapnel in both legs; Hanaa’ Shaheen, 29, was injured by shrapnel in the right leg; and Hala Abu Thaher, 23, was injured by shrapnel in the stomach. The three female paramedics with the Union of Health Work Committees were injured, while at the demonstration in the east of Al-Bureij refugee camp. -- Ahmed ‘Arram, a 29-year-old freelance photojournalist, was wounded in the mouth with a live bullet in eastern Khan Younis. -- Mo’een Al-Dabba, a 29-year-old correspondent for Palestine Today, was wounded with a plastic-coated bullet in eastern Gaza City. -- Bilal Nofal, a 24-year-old photojournalist with Siraj Media Network, was wounded in the right thigh with a live bullet in eastern Gaza City. -- Mahmoud Shatta, a 25-year-old photojournalist with Forsan Al-Haqiqa Media Network, was wounded in the left leg with a tear gas canister in eastern Rafah. At 4:16 pm the same day, a Palestinian Red Crescent Society ambulance was damaged when Israeli forces fired a live bullet at the left door in eastern Jabalia. Al Mezan’s documentation shows that from the start of the Great Return March protests on 30 March 2018, 222 Palestinians have been killed in the Gaza Strip. Of the total fatalities, 168 were killed at the demonstrations—including 33 children, one woman, two journalists, three paramedics, and four persons with disability. Another 11,968 persons have been injured, including 2,329 children, 500 women, 128 paramedics, and 132 journalists. Of those injured, 6,819 were hit by live fire, including 1,206 children and 140 women. The Israeli forces continue to keep the bodies of ten fatalities, including two minors. Al Mezan reiterates its condemnation of the use of lethal and other excessive force by the Israeli forces, including sharpshooters, to police demonstrations. Al Mezan expresses deep concern at the continued attacks on children, as well as on journalists and paramedics, who are visibly marked as such. Al Mezan stresses that the right to peaceful assembly and free expression are fundamental rights and must be respected. Unarmed protesters not posing any serious or imminent threat to the Israeli forces must not be shot.